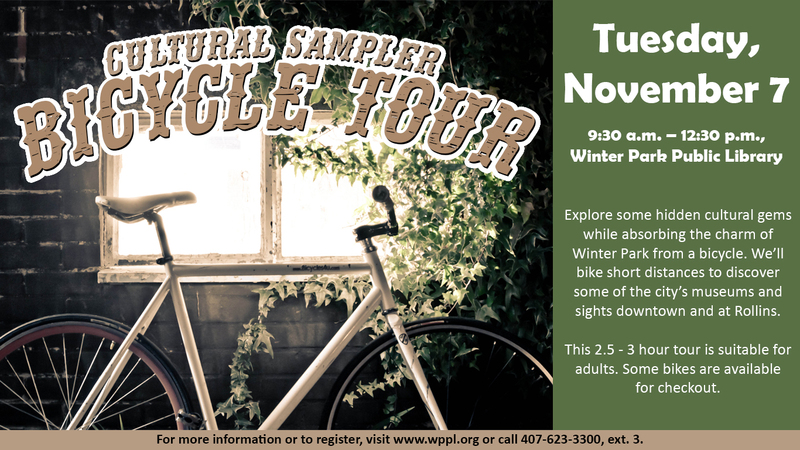 Explore a sampling of our city’s hidden cultural gems while absorbing the charm of Winter Park from a bicycle. We’ll bike short distances to discover some of the city’s museums and sights. With multiple stops and easy cycling, this 2.5 - 3 hour tour between historic downtown Winter Park and Rollins College is suitable for adults who want to explore Winter Park’s artistic culture. The tour begins in the Library parking lot. A limited number of WPPL Check-out Bikes are available for participants. If you would like to use a Library bicycle please request this in the Special Notes box below. Register using the form below or call 407-623-3300, ext. 3.